From our Rosewater Shampoos and Conditioners, to our Greenspot Remover to our Super Bodyshine® and Detangler and Shine- nothing out produces the results Cowboy Magic® brings horses! 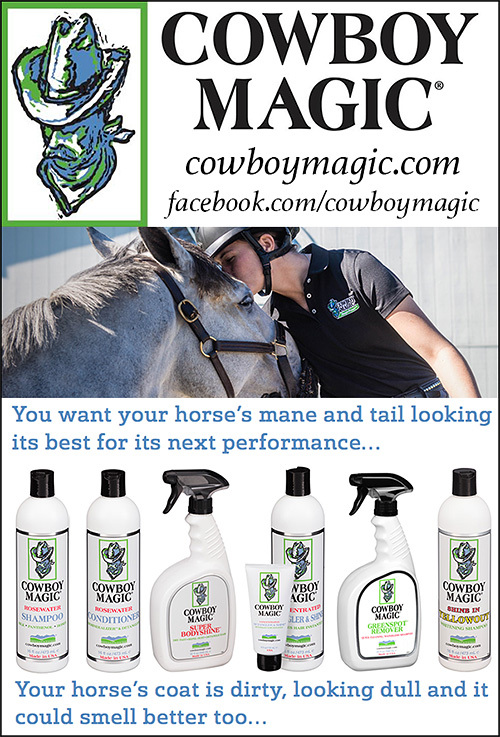 Cowboy Magic was originally founded by Jim and Charlotte Cummings in 1979, providing high quality grooming products, including shampoos, conditioners, and finishing sprays & gels for the equine world. Its star product, concentrated Detangler & Shine gel created the category and continues to be the leading detangler and shine for horses. It has become a staple product in tack boxes all around the world. Upon Jim and Charlotte’s recent retirements, their goal was to keep the legacy of Cowboy Magic ongoing. To keep the tradition of making high quality formulas for grooming, Straight Arrow Products, Inc now includes Cowboy Magic in its stable of grooming lines. Cowboy Magic® Greenspot Remover can help remove urine, manure, and other spots instantly! It is concentrated: Greenspot® Remover/Shower in a Bottle is made from very expensive, natural, non-sudsing cleaners derived from plants. It works instantly: Breaks down foreign molecules and dissolves manure, urine, dirt, and sweat, melting them away. It is a deep conditioner: We have added silk and panthenol to strengthen the hair and condition the skin. It creates a shine: We have added shea butter to make it possible to brush up a shine after drying. It is important to use a damp towel to activate the ingredients. Follow up with a dry towel to pickup and absorb manure, dirt or sweat. It only takes a small amount: Spray on a small amount and massage it in and wipe it off. Repeat, working on small areas. Spray, massage in, wipe off, spray, massage in, wipe off. Note: It works on people too! Human hair care salons have been offering this special service for a long time. You can use COWBOY MAGIC® as a conditioner and body builder after shampooing. Hair will instantly look and feel soft and clean with full body and be more manageable. Cowboy Magic® Shine in YellowOut ™ Neutralizes yellow stains and brightens hair of all colors: Black, White, Chestnut, Bay Brown, Roan, Palomino, Paint! Directions: Apply to wet hair, massage in until blue suds turn white. Soak for two to five minutes, then rinse well before repeating, if necessary. Permanent Stains: Try COWBOY MAGIC® GREEN SPOT REMOVER®, then continue to reapply COWBOY MAGIC® YELLOWOUT™ per directions. If stain persists, it may be permanent. Continue to follow directions to minimize permanent yellow stain until stained area can grow out. COWBOY MAGIC® Detangler & Shine is a high quality cosmetic that is great for little girls with long hair and adults of all ages too. Cowboy Magic® Super Bodyshine® is formulated to give hair a super shine. Helps repel show ring dust and dries fast.is formulated to give hair a super shine. Helps repel show ring dust and dries fast. : SUPER BODYSHINE® is concentrated and ready to use. It works instantly! Formulated from nature’s natural ingredients just spray it on and stand back and prepare to smile. SUPER BODYSHINE® dries fast and reflects a full spectrum of light resulting in a maximum body shine under sun or show ring lights.
. We have added Aloe Vera to strengthen and condition hair and skin. It helps repel dust! SUPER BODYSHINE® makes it more difficult for show ring and stable stall dust to collect on hair saving grooming time and work. It is long lasting. SUPER BODYSHINE® will not become gummy and sticky after days of use, reducing the number of trips to the wash rack.formulated to give hair a super shine. Found in nearly every tack store, quality horse catalog, Cowboy Magic® products have been setting the standard in coat, mane and tail care in the horse industry for over 30 years. Order today!